IF You ALREADY purchased this trick, enter your unique code, included on the edge of the coin, to activate your free account. Want to find out what it is? Read on! Imagine the magician throws a deck of cards into the audience. Whoever catches the deck is asked if he or she has a cell phone on them. Before the deck is opened, the magician gives them a piece of paper with a phone number on it. The audience member takes out the cards and FREELY SELECTS ANY CARD they like. With the magician faced away from the audience, the spectator shows their selection to the people around them. 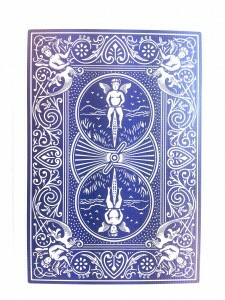 The card is returned to the deck and the deck is returned to the box. The magician asks the spectator to call the phone number on the piece of paper and ask for Carl the know it all. (Have them place their phone on speaker so others can hear). Carl will get on the phone, tell you what card you selected and tell you “Better luck next time” just before he rudely hangs up on the caller! This is a variation of the Wizard effect with a few changes. This version the spectator makes the call and the magician never touches the cards during the entire presentation. It uses some of the technology from Smart Phone Card trick, to make it all happen! This effect is for NFC enabled phones like the Galaxy S III or newer. Most new android phones (about 90 different models) have it but it will not work ON the iphone. No problem. save this gem for when you encounter someone with an NFC enabled phone or simply ask, in an audience setting, if you have anyone in the audience who has a Galaxy S III and USE THEM! If you as the magician have an iphone that’s fine because the trick doesn’t use YOUR phone. You can still control all of the “magic” from your iphone so don’t let the fact that the current version of iPhone hasn’t adopted NFC technology, stop you from performing this visually impossible effect! You’re using a regular deck of cards, the spectator’s own phone, their selected card and a fingerprint on the box to identify the selected card as the image of THEIR CARD appears on their own smartphone! Repeatable with a different outcome every performance. Even a method included to do a 100% FREE selection with them holding the deck and choosing from the cards face UP, they use their phone and handle everything themselves the entire time. They select the card. They put their fingerprints all over the card. They show the audience and return it to the deck they are holding. They shuffle the deck and hand it to the magician who gives the deck one cut and returns the entire deck to the box and closes the box. The spectator places their thumbprint in the center of the card box. Using their own phone, they open a barcode scanner or camera and scan the thumbprint by placing the camera lens right over the top of the box and allowing the camera to scan the thumbprint. Once the scanner has identified the thumbprint and matching card, an image of that card is displayed on the spectators own phone! Save the image to your smartphone, share it on facebook or twitter or email it to a friend! The entire effect can be done with the phone in the spectators hands the entire time. This is an original effect that’s great for walk around or restaurant workers. Do multiple selections and have all of the selections appear in order. Automatically ready for the next performance with no reset needed! With smart phone technology growing at an unprecedented rate, we found with the newer phones (like the Samsung Galaxy S III pictured here) you can actually use that technology to identify a selected card. Any individual with a smart phone that has this new technology can see it in action. It can, through the help of an online search engine, determine the card that was selected and then locate an image of the selected card which it displays on the spectators cell phone! (This magic effect can be repeated over and over. REGARDLESS what playing card the spectator chooses, his selected card will be identified and displayed on HIS smart phone! 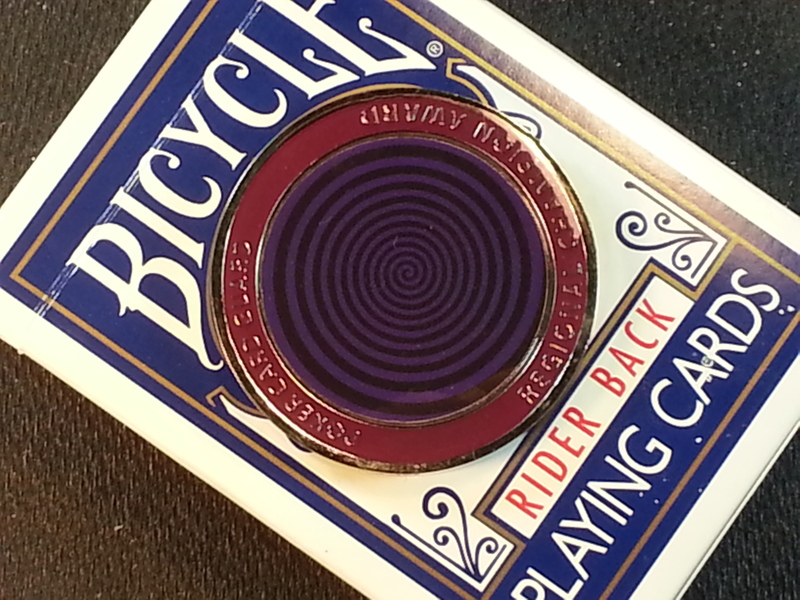 The Smart Phone Card Trick is a magic trick that uses cutting edge smart phone technology to reveal the selected card on the spectators own smart phone. The ability to “change” the end result adds a new level of possibility when performing this effect. 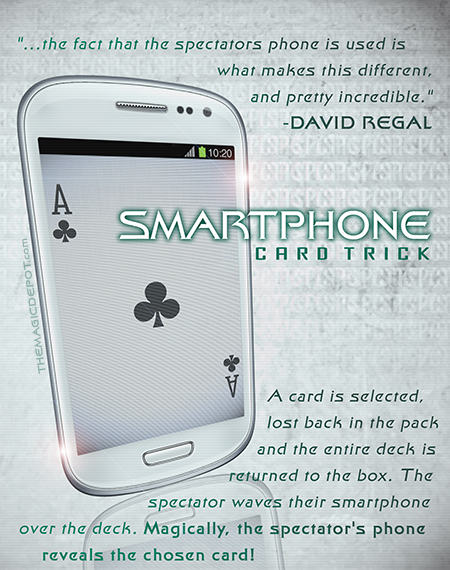 The Smart Phone Card Trick is easy enough for a new 8 year old magician, yet powerful enough for a world class professional magician.